Successful warehouse operators place a high value on worker safety. Every business that has a warehouse should have a formal, written warehouse safety program. This program becomes the playbook to develop operating procedures and employee training. It is used to standardize processes so that they are able to be repeated each day in a safe manner. 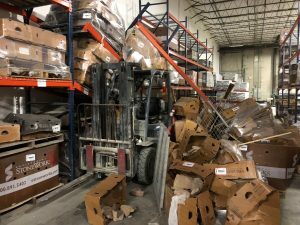 Don’t wait until an accident occurs to develop and implement a Warehouse Safety Program! This not only puts your employees at risk, but it may also put you out of compliance with the law. Being proactive in developing a safety program will give you ease of mind while also saving you time and money. Stein creates partnerships with our customers to help them become more efficient, safer, and more profitable. Contact us today to find out how we can help.